The interwebs have been rife with rumors that Samsung scrapped the planned November 11th launch of the Nexus S to roll out a dual-core version. Not that this is surprising, partly because Samsung had announced their dual-core Cortex A9 Orion back in September, but because dual core phones were expected to show up next year, not before. 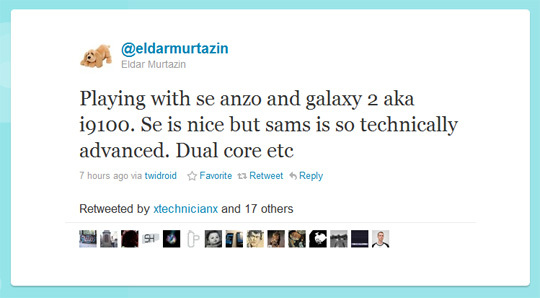 But today a Russian blogger by the name of Eldar Murtazin tweeted that he had played with the dual-core Samsung GT-i9100 (or Galaxy 2). He said that he was impressed with the device and that it had a better display than the Galaxy S, featured a plastic casing, and was scheduled to launch in Q1 2011. Take a look. That the original Samsung Galaxy S had the model number GT-i9000 certainly leaves open the possibility that the newer GT-i9100 is indeed the new dual-core platform. Interesting features of the onboard Mali-400 GPU include 4 cores (or “fragment processors”), 1080p video decode/encode, and fives times the 3D graphics performance of previous Samsung processors. Phew. There are whispers that Google may be launching Gingerbread onboard a Samsung device. Whether that is the GT-i9100 or not remains to be seen.